Who thinks theres anything wrong with two tone guns? Who actually thinks theres anything wrong with two tone airsoft guns? Two tone guns make it easier for people to get into the sport, so I don't think there's anything wrong with them. I don't look down on someone for turning up and using one, and I don't always assume they're a new guy*. That said, I never went and got one myself on the grounds that they're far too colorful for me. 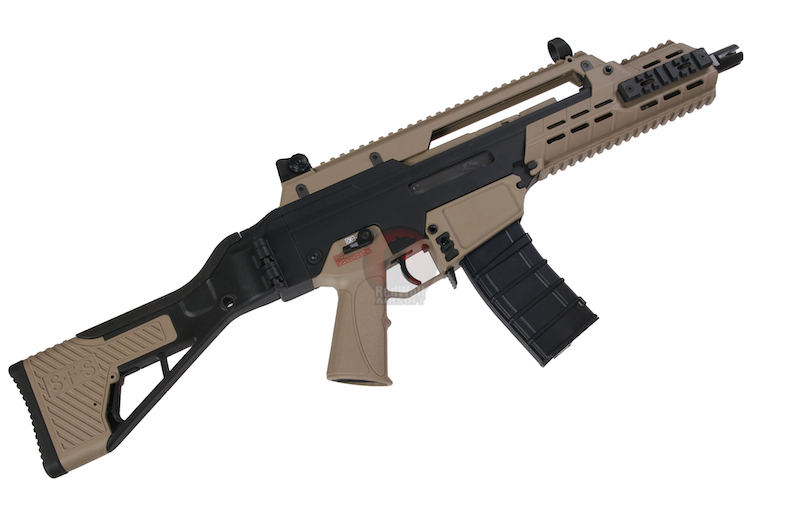 I got UKARA registered to buy a black one as soon as possible, but for people who don't skirmish often, or don't use the same site enough times to get a membership, two tone guns seem like an easy way for them to have their own kit. I dont care if someone has a two tone or not. If they are out of the house doing it they have my support. Its all down to personal prefference what you buy but I havent and I have never heard anyone talk down to someone because of the colour of thier gun. Does that mean you do ? why ? I don't have an issue with 2tone guns.... I have an issue with junk plastic crap that some retailers sell with the pretence that they are skirmishable! I thing the whole UKARA and two tone could be implemented slightly better, law is poorly written and instead of putting permanent change to gun put a colorful tag on gun with a marking and serial number thath you need to keep for 3 games, after 3rd game it can be removed, and if you do it early you break the law and you can't apply for UKARA for 1 year, easier for players and for shops, they wouldn't have to paint guns. Owning a RIF is not an issue, selling one to someone under 18 or without a defence is. A parent can currently buy an orange aeg for their under 18 kid to play with, so can joe blog for him to plink with. If you put a wire lock anti tamper on a rif and allow anyone to buy it, how does that stop idiots buying it? So who's robbing banks? Could do with the extra cash for more guns haha. Why not have an airsoft license, similar to a driving one. All held on a national database, and the license can be revoked. Must be over 18 to hold one, and no purchase of RIF allowed without it. Players will have to sit a theory test on VCRA, UKARA, safe handling, correct terminology, battery storage, etc. And a practical exam to demonstate proper use of eye-pro, magazine and battery changes, safety procedure before entering the Safe Zone, etc. Their Airsoft license can be checked at sites to make sure the player is legal to carry a RIF. And a provisional license for under 18s, to make sure they are responsible enough to be allowed to use a two-tone gun. Could also introduce gun registration numbers. Every gun has a unique index number, held on a national database, and when you sell a gun you complete the details of old owner and new owner and send them off to the Airsoft Licensing Agency (could be located in Swansea for example). This would also mean stolen or lost guns could be traced back to the owner. Note: Yes, it is April 1st. And this is not a serious post. Given my current experience: why ear plugs are important. Yeah I own a two tone as no one in my family or myself has UKARA so whenever I get gifted guns for Christmas and birthdays they are two tone. Usually black and a mild green. I have had the odd garden shooter from JBBG in the past but the latest gun I was gifted was a CM16 from G&G so it is fairly capable I holding up in a skirmish. So I was just wondering if there looked down upon or if people won't play with you as it ruins there emersion or something. I was just wondering is all. No two tone guns = Having to rent and go to the same site three times before you can buy your gun, spending a total of around £75 on a gun that isn't yours. I've got first hand experience of previously very eager people who have looked at that and thought 'nah, sod it, it's probably not worth it after all'. Two Tone guns = Having the option to buy a nice starter gun and get cracking straight away. Comes with a sense of ownership, and the good feeling that comes from knowing you own your own kit, and you've started your own armory. Techies get to start exploring with tinkering on their kit, gun-nuts get to start looking at accessories to stick on it. Additionally, the purchase will make someone more likely to continue the sport if they have a bad couple of first game days, as they've already made the investment. No dont have anything against TT in a skirmish. The BBs hurt just as much. I don't really see much immersion in skirmishes. To be honest, I think some two tones look pretty cool. However, I do have a question. What's stopping someone getting a two tone and respraying the coloured parts to a nice tan colour? Is that frowned upon at all? EDIT: I forget the exact wording, but the non-black color needs to be particularly bright, otherwise it's not classed as two toned. What's stopping someone getting a two tone and respraying the coloured parts to a nice tan colour? Is that frowned upon at all? Yes, tan is guns look naff . Would rather have a bright yellow or an orange one anyday. In the eyes of the law, that gun is not two-tone. Prescribed colours and transparent only. I guess it's a matter of our personal likes. I think they look pretty neat. Sorry for the hi-jacking of the thread.